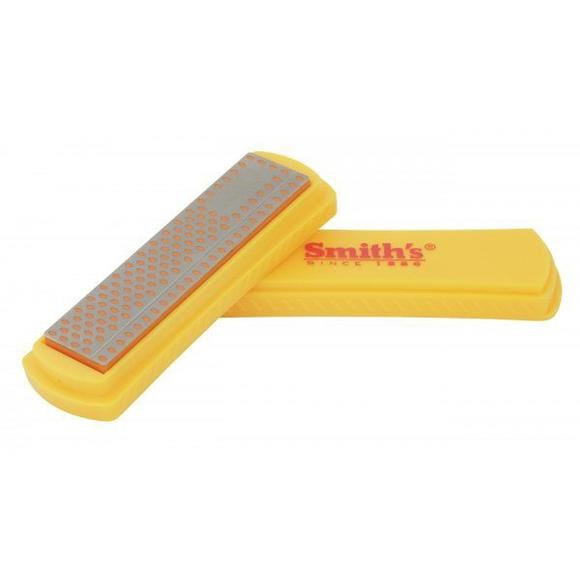 Smith's Abrasives' 4 Inch Diamond Sharpening Stone: Fine offers the ultimate in sharpening technology. It features multiple layers of micron-sized moncrystalline diamonds bonded in nickel to a flat metal surface. The new 4 inch x 1inch sized diamond sharpening stone is mounted on a plastic base and has a plastic lid to protect the stone when not in use. Smith&apos;s Abrasives &apos; 4 Inch Diamond Sharpening Stone: Fine offers the ultimate in sharpening technology. It features multiple layers of micron-sized moncrystalline diamonds bonded in nickel to a flat metal surface. The new 4 inch x 1inch sized diamond sharpening stone is mounted on a plastic base and has a plastic lid to protect the stone when not in use. During use, the plastic lid can be inserted into the bottom of the stone base to extend the height of the base and make sharpening your knife safer. The user&apos;s fingers grip lower on the base and remove any chance of cutting your fingers when pulling or pushing the knife&apos;s cutting edge across the sharpening surface.